The search for the perfect Paleo pancake continues! Carrot cake pancakes are one way to do it, but what if you’re not into a lot of almond flour? Well, here’s a Sunday brunch recipe that doesn’t rely on any kind of flour at all – in fact, it’s completely nut-free, so even if you’re avoiding nuts for some reason, you can still enjoy. The recipe calls for vanilla extract and cinnamon, but you could add whatever spices you like – bananas make a tasty delivery vehicle for just about anything. The instructions also give amounts for one person, but it’s easy to modify for a group; just use the ratio of 2 eggs:1.5 bananas. For example, for four people, you’d use 8 eggs and 6 bananas. You’ll get best results with this recipe if you use ripe bananas: go for the ones that already have brown spots. And with just eggs as a binder, you’ll also find it easier to make smaller pancakes: big ones have a tendency to break apart when they’re flipped. Pile up a big stack of pancakes on your plate, top it all off with some berries and maple syrup (or honey, if you like), and enjoy! Crack the eggs in a bowl and whisk them. In another bowl, lightly mash the bananas with a potato masher or a fork. Add the egg, the baking powder, the vanilla, and the cinnamon to the mashed bananas and stir to combine. Pour about 2 tablespoons of the batter at a time onto a skillet placed over a medium-low heat and cook until the bottom appears set (1 to 2 minutes). Flip with a spatula and cook another minute. Serve immediately, topped with fresh fruit and maple syrup (if you like). 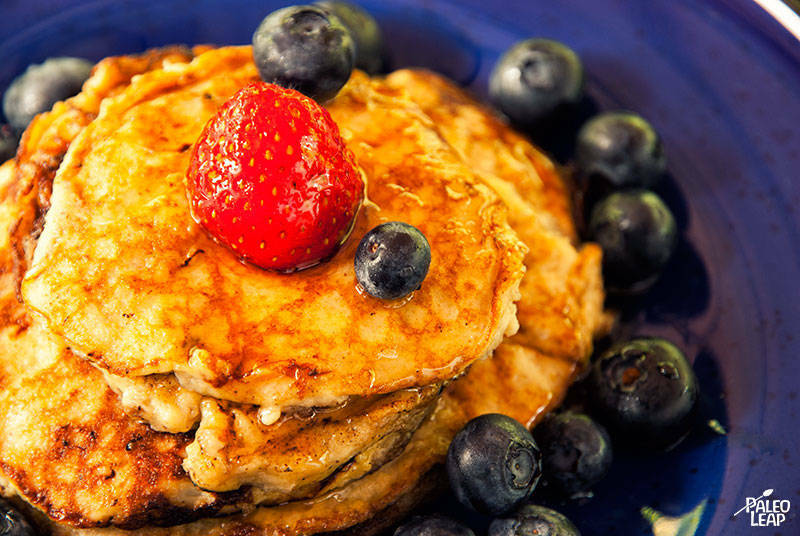 Check out our compilation of Paleo pancake recipes for more great ideas.